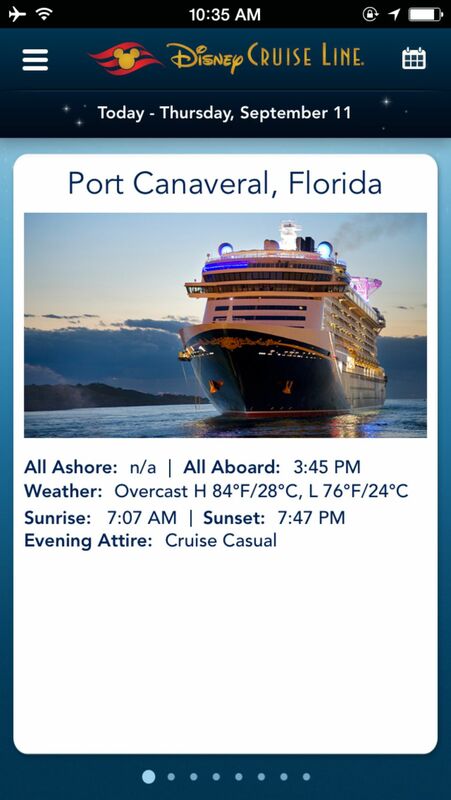 Disney Cruise Line Navigator App: It's Free, Fab, and Fun! Taking a Disney Cruise? Now there are two ways to stay on top of what's happening on the ship. Every day of your cruise, the paper "Personal Navigator" gives you a stem-to-stern rundown of special events and parties, youth and adult activities, character appearances, and entertainment. Or you can lose the paper and personalize your trip on your smartphone with the help of the Disney Cruise Line Navigator App. It's available for free for iPhone and Android, and it's a great way to organize your time and make sure you don't miss a thing. Best of all, everyone in your family can download the app and personalize their own shipboard experiences. Download the app from the Apple App Store for iPhone or Google Play for Android. Once onboard, go into your phone's settings and turn on Airplane Mode. This is a smart move even if you don't use the app, because it will turn off your data so you're not smacked with an expensive wireless bill when you get back from your trip. Connect to wi-fi on the DCL-GUEST network. Now you're ready to go. The app is free and only works on the Disney cruise ship. The paper version of the "Personal Navigator" gives you a full day's schedule, but it's not available until the night before. You'll find the next day's "Personal Navigator" in your stateroom when you return in the evening after dinner. One advantage of the Navigator app is that it gives you an overview of all the events for the entire cruise, so you can jump ahead and see what's coming up. Since it gives you the big picture of all your options—a movie that will be screened multiple times on the same cruise, for example—it's great for those of us who like to plan ahead. Someone in your family doesn't use a smartphone? Let them have the paper "Personal Navigator" all to themselves. The app is simple to use and very intuitive. The main menu lets you quickly find what you're looking for. It's easy to see all the activities happening on the ship—including when they start and where to go—as well as the scheduled activities during your day on Castaway Cay. You can filter activities by age group, so kids, 'tweens and teens can make sure they don't miss any of the fun events at the Oceaneer Lab, Oceaneer Club, Edge, or Vibe. When you see an activity or event you like, simply select the heart icon and it will be saved into your personal schedule. Everyone in the family with a smartphone can select their own don't-miss activities and keep his or her own personal schedule. Keeping tabs on kids is a snap with the chat function, which lets you send and receive text messages with the family members in your stateroom. One of the wonderful things about taking a Disney Cruise is being able to meet Disney characters in a more intimate setting that you might find at the theme parks. The Navigator app lets you know where each character has scheduled appearances with an official Disney photographer. You are always free to take personal photos, so don't forget your camera. Any activities that you've saved by clicking the heart icon will be stored in a handy personalized schedule. On the fence? Go ahead and save it with a heart. If you change your mind later, just deselect the heart and the activity will be removed from your schedule. You'll get an alert 15 minutes before the activity so you won't miss anything. And since different family members can have their own favorites saved, everyone can do what they like. Are your kids begging to go to the AquaDuck? Can't remember how to get to the Guest Services desk? Finding your way around the ship is a breeze when you have all the deck plans at your fingertips. Wondering what's for dinner? The Navigator app lets you sneak a peek at the dinner menu. Super handy if you've got dietary restrictions, a picky eater, or a big appetite. The last morning of your cruise can be hectic if you're not organized. The Navigator app gives all the need-to-know info for debarkation day, from packing tips to necessary documentation and post-cruise transportation options.